Other motorists have a duty toward motorcyclists, particularly because motorcyclists are at a higher risk due to the nature and size of the motorcycle and the lack of protection. Motorists have a duty, just like with a pedestrian, to have a higher sense of duty to be on the lookout. However, there are no specific state laws in Missouri that address this issue. How Does A Motorcycle Accident Differ From A Passenger Vehicle Accident? There is a lack of protection and, depending which state you live in, there are various laws about whether or not a helmet is required for motorcyclists. In Missouri, a helmet is required for operating a motorcycle but in Illinois, the neighboring state, there’s no helmet law requirement. The nature of any accident involving the body falling on the pavement or colliding with a vehicle that is two times the weight of a motorcycle creates a very risky situation for someone operating the motorcycle. What Types Of Injuries Typically Occur In A Motorcycle Accident? Motorcycle riders tend to sustain more serious and severe injuries from accidents than someone who is a passenger or a driver of a vehicle because of the lack of protection. Most injuries are related to head injuries, depending on whether or not there was a helmet involved. If there was a helmet involved, it still doesn’t limit that body from being damaged by a fall, particularly if it’s at a high rate of speed or the biker is ejected from the bike. 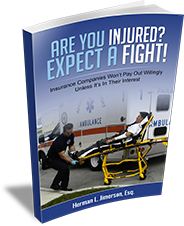 Then, you are looking at very severe injuries such as broken bones, concussions, death, or any other type of injury. Just like in any other motor vehicle accident, we look to see who was negligent. We tend to look at who’s at fault, what caused the accident, and the severity of the damages. What Type Of Damages Can I Recover In A Motorcycle Accident Case? Most damages to motorcycle drivers are quite serious, either because of falling from a bike at a high rate of speed or colliding with another vehicle that weighs more. However, there are some limitations of damages in Missouri. The wrongful death statute only covers up to $250,000 for the loss of life. This does not include any loss of economic value to the person or anything of that nature. However, if something less than life threatening happened, there might be higher damages. This includes loss of capacity to earn income, loss of limbs, or other types of things that may impact a person’s livelihood. It all depends on what type of damages occurred but most damages are quite serious and quite high. Do I Still Have A Claim If I Got A Ticket In My Motorcycle Accident Case? In most cases, an officer may issue multiple tickets. He may issue a ticket to the other driver or he may issue a ticket to the motorcycle driver. A ticket does not negate liability of another party, nor does the officer assume to judge whether someone is at fault or not. He simply issues a ticket for what they believe is a violation of the law. That doesn’t mean that the person is negligent. The officer may have given a ticket because the license plate is expired. It doesn’t always have any relevance to your case. For more information on Motorcycle Accident Claims In Missouri, a free initial consultation is your next best step. Get the information and legal answers you are seeking by calling (314) 786-3536 today. Home > Personal Injury > Do Other Motorists Have A Duty Towards Motorcyclists On The Road?